In over 40 years of dedicated collecting by Lilly Ernsting, one of the most important glass collections in Europe has been created. It represents the contemporary European glass art since the 70's in a unique way from the applied to the autonomous glass. Lilly Ernsting founded the Glass Museum in 1996 with her husband, Kurt Ernsting (1929–2011), in order to share all the joys of glass art with the public. 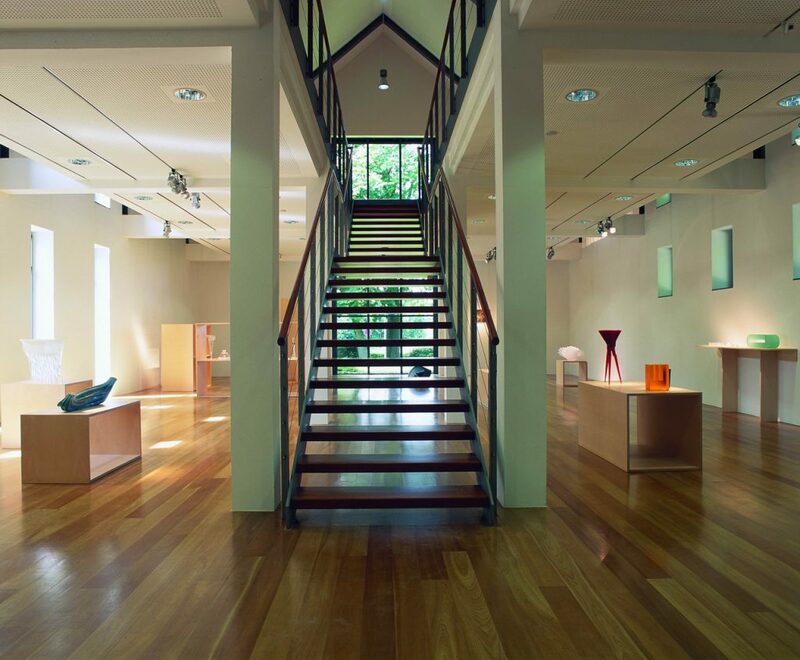 The museum dedicates itself not only to displaying the collection but also to discovering and exhibiting the latest trends in artistic glass. Several exhibitions are mounted annually, with a show of new acquisitions kicking off each year. Other shows feature artists whose work addresses specific themes. Rounding out the programme are exhibitions of works by students of art academies, universities, or glassmaking schools that were completed during their studies or as final projects. The collection is constantly growing through acquisitions of current works of outstanding quality. 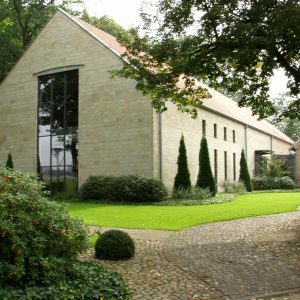 The former estate of the village mayor of the district of Coesfeld-Lette, now known as the “Alter Hof Herding”, has been home since 1995 to the eponymous foundation for the promotion of art and culture run by Kurt (1929-–2011) and Lilly Ernsting. 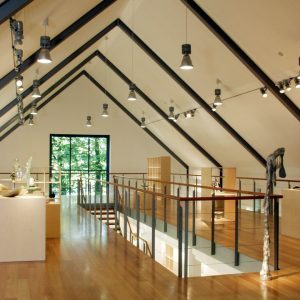 The well-maintained and architecturally appealing ensemble of Glass Museum and Alter Tenne (old barn) has become a major cultural attraction in the region. At the same time, it is an outstanding example of the careful and thoughtful merging of past and future. Upon first entering the premises, visitors feel warmly welcomed. Their curiosity is aroused as they take in the mix of architecture old and new. Yesterday and today come together here, conveying an idea of the respect and care taken with both the heritage of the past and the creative spirit of the present. Visitors can sense the lively discourse between historical periods as well as the open attitude towards the future. The modern and functionally designed museum building flanks the path leading to the main entrance to the ensemble. 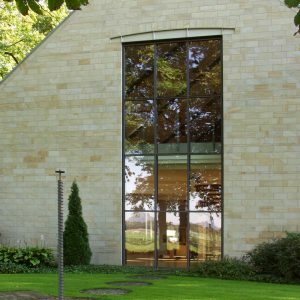 The tall window in the gable wall and the building’s elongated form are reminiscent of a barn, reminding visitors that a tithe barn once stood here. The entrance to the museum is through the former main building of the manor, the Alte Tenne, a barn with threshing floor and residence whose historical architecture provide an idea of what the manor must have looked like once. Exhibits from the early years of the glass collection are on display here. In the keystone of the barnyard gate, the year 1977 and the names K+E Ernsting are engraved. This year was a crucial milestone in the history of the Alter Hof Herding, because without the personal commitment of Kurt and Lilly Ernsting to culture and its preservation, the manor would have had a bleak future. Embedded in the former agricultural cooperative of the Westphalian Mark, the Alter Hof Herding and its inhabitants lived through an eventful history of social and economic changes extending into the 20th century. The founding date of the manor is not documented. It is first mentioned in the records in 1359, when Engelbert Schulte Herdinck (Herding) acted as witness to the sale of 40 unmarried or widowed Lette peasants (all listed by name) who were under the sovereignty of the squire Heinrich von Lette to Varlar Abbey. This record contains three important pieces of information. As Schulte, or village mayor, Engelbert Herdinck managed a manor in Lette; Heinrich von Lette had a noble estate there; and Varlar Abbey had rights to Lette. There are reports on this so-called noble estate in Lette dating back to 1175. The connection of Lette with the Premonstratensian Varlar Abbey, founded in 1022 near Coesfeld, can be traced back to 1142. Pope Innocence confirmed the abbey’s holdings and its rights to tithes from Lette. The abbey gradually expanded its lands and holdings and acquired a number of properties and rights in Lette from 1260 to 1376. The sale during this period of bondsmen to the abbey, in 1359, suggests that Herdinck (Herding) Manor was dependent on the abbey and thus responsible for collecting the goods produced by the taxable lands on behalf of the abbey. Bills and charters attest to payments made by the manor to the abbey over many centuries. In the secularisation of 1803, Varlar Abbey and Herding Manor became the property of the princes of Salm-Horstmar in Coesfeld. The sources report that the descendants of Engelbert Schulte Herdinck were involved in politics and the Church. Johann Herdinck served in 1528 as a juror at the Merfeld court. Vincentus Herdinck was a church administrator in Lette in 1576. Other members of the family sat on the board of Lette’s poorhouse or were members of the municipal council, witnessing marriage contracts or wills. In 1738, Jodocus Henrichus Thier, known as Schulte Herding, had a wayside shrine built out of Baumberg sandstone in memory of his two deceased wives. This memorial was renovated in 1979 with funds from private initiatives and associations and re-erected near the road on the manor grounds. The stone monument shows the celebration of the Eucharist, with two cherubs facing the viewer and holding a chalice between them, atop which is the host wafer surrounded by a corona. Below the image, the names of Schulte Herding and his two wives, Anna Gertrudt and Elisabeth, are inscribed on a panel. The earliest known descriptions of the architecture of the village mayor’s manor date back to the mid-18th century. The barn with threshing floor and integrated residence (“Tenne”) was built in 1743 using post and beam construction to create a typical Westphalian four-post farmhouse as can be found throughout the central Münsterland region. An excerpt from the land register dating to 1825 confirms the existence of the manor with its residence adjoined by a barn, the tithe barn. The ensemble is not described in more detail until 1853, when it was demolished and rebuilt after a fire in December 1851 that rendered the residential wing uninhabitable. Departing from the traditional design of such a building, which incorporated the threshing floor and living area under one roof, the client now opted instead for what was for the time quite an imposing, two-storey, saddle-roofed house at the gable end of the barn, overlooking the garden. Both buildings are made entirely of brick with hewn stone window and door soffits and are today the sole remaining witnesses to the Alter Hof Herding. Their simple yet classical style with its symmetry and axiality is representative of many such manors that were once found throughout the Mark of Lette. As a result of the government-imposed division of the Mark in 1820–21 under King Friedrich Wilhelm III, measures to divide up Lette were undertaken and then completed nearly 29 years later, in April 1849. 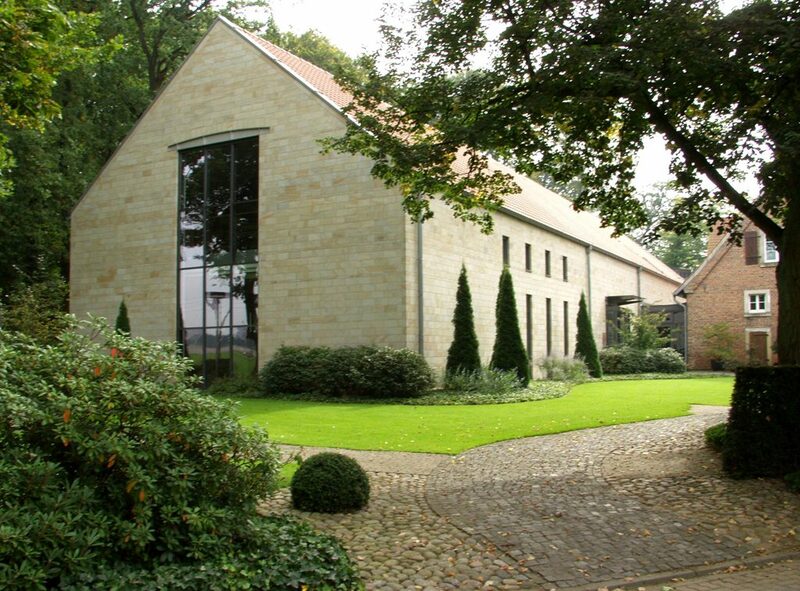 We can assume that it was during this period that Herding Manor passed into the private ownership of Schulze Herding. It was henceforth managed by him autonomously and remained in the family until the 1970s. But the sweeping changes in agricultural practices affected Schulze Herding as well, and so he planned to build a larger manor at another location in Lette. As luck would have it, Herding Manor would witness a new chapter added to its history. Kurt and Lilly Ernsting learned in 1976 that the manor was to be torn down, which they couldn’t imagine, seeing as how it was a part of the history of rural life and work in Lette. Without a concrete idea about the further use of the property, they purchased the house and grounds from the owner, Schulze Herding. Two decades would go by before they found what would prove to be a lasting solution for the site. At around the same time, Lilly Ernsting began to take an interest in studio glass, artistically designed glass. Her fascination with the material and the pleasure she took in glass art grew steadily and she became an avid collector. In the mid-1990s, she and her husband decided that they would like to display their now considerable collection to the public. They wanted to share with others the joy that glass had brought them. 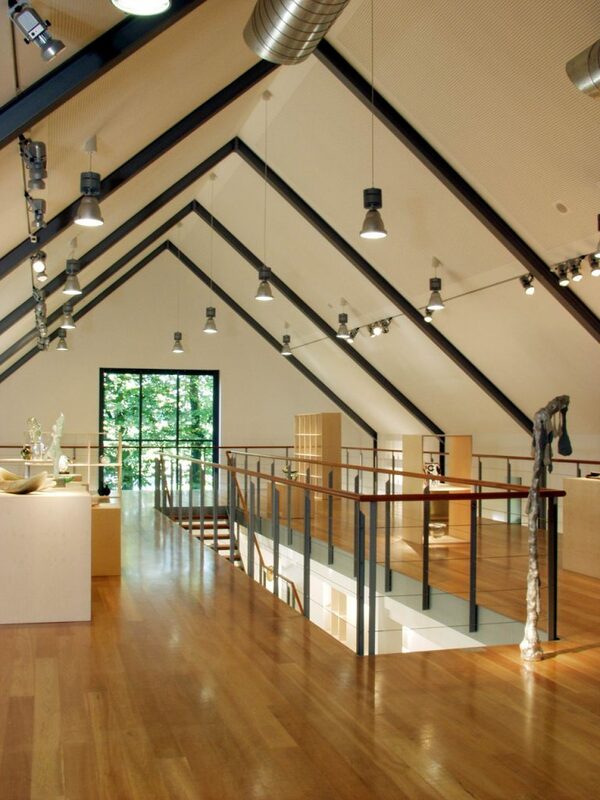 The glass collection then finally found a new home and exhibition space in 1996. 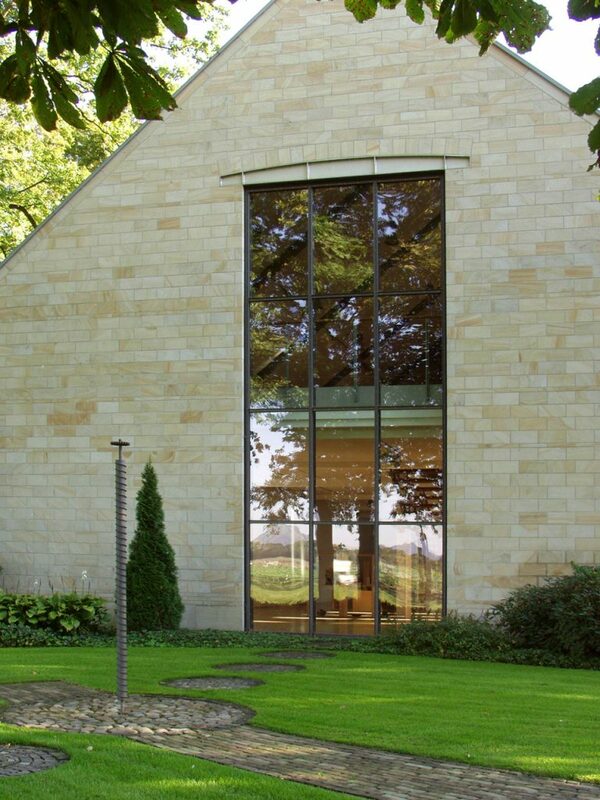 The old barn, whose predecessor building had been used among other things as a tithe barn, was torn down, and on its foundations rose a spacious, saddle-roofed, two-storey hall built of Ibbenbüren sandstone in a functional style. 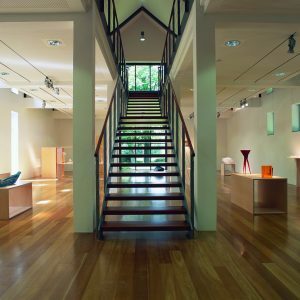 The building houses two large exhibition galleries, offices, a small kitchen, and a seating area where visitors can linger and read all about glass. Inside, the historical four-post structure with its threshing floor still echoes in the gallery-like upper floor that has been inserted, filling in ideal fashion the new building’s function as a museum. The glass objects reflecting over 40 years of collecting trace an arc from the early days of studio glass to the present day, showcasing current trends in glass art now that it has developed into an independent art form. A passageway lined with large glass sculptures leads from the museum to the “Alte Tenne” and thus the heritage architecture. This elegant transition from the new to the old building, in keeping with the original style of the ensemble, forms a pleasant contrast. The Alte Tenne once served as a stall for horses, pigs, cows and chickens. We can once again experience here the old Westphalian four-post construction, whose original configuration has been preserved to give an authentic impression of the past.